Overhead Security Doors, Overhead Steel Doors can be Insulated, Loading Dock Doors, Sound Resistant Doors. Coiling Shutters have bottom bars that can be Brass, Copper, Galvanized, Aluminum, Stainless Steel, Hot Rolled Steel, Powder Coated, Weather Strip, Brush/Smoke Seal, Pneumatic Edge, Electric Edge, Wireless Edge, Double Angle, Tubular, Extruded “T”, Slope Bar, Curb Closure Plate, Special Cut-Out, Slide Lock. Soundproof Rolling Shutters can have bracket plates that are Brass, Copper, Hot Rolled A36, Stainless Steel, Galvanized, Powder Coated, Stop Lock Bearing, Internal Charge, Charge Wheel, Motor Prep., Chain Gearing, Thru-Wall Drop Plate, Round Bracket, Square Bracket, Hex Bracket, Single Gear Reducer, Double Gear Reducer. Overhead Security Doors can be Hot Rolled A36, Galvanized, Stainless Steel, Torsion Spring, Life Cycle 17.5 to 400M, Welded Tabs, Taped Holes, Redi-Tube Motor, Thru-Shaft Push-up, Inside Charge, Lock Shaft Collar, Keyed, Bolted. Overhead Steel Doors can be Brass, Copper, Hot Rolled A36, Stainless Steel, Aluminum, Galvanized Steel, Powder Coated, Structural Angles, Roll Formed Angles, Weather Stripping, Brush/Smoke Seal, Chain Lock Box, Electric Interlock, Heat Tracing, Teflon Lining, Tube Mounting, Pack Out Angle, Flat Plate Mount. Soundproof Rolling Shutters, Sound Resistant Doors hoods/covers can be Brass, Copper, Galvanized, Stainless Steel, Aluminum, Galvalume, Prime Painted, Powder Coated, Hood Baffle, Lintel Seal, Smoke Lintel Seal, Back Fascia, Tension Cover, Operator Cover, Round, Square, Hex, Side End Cap, Motor Cover, T.O.C. Cover, F.O.C. Cover, F.O.W. Cover. Soundproof Shutters and Sound Resistant Doors can be 24 Gauge, 22 Gauge, 20 Gauge, 18 Gauge, Polystyrene Board, Polyurethane Foam. Coiling Shutters can be Chain, Motor, Hand Crank, Redi-Master, Redi-Lift, Chain Gear Reducer, Euro-Drive. Below you will be able to download details for Alpine’s IMB-V8® insulated roll up shutters. The details for the overhead security doors are available as a PDF. Click here to request a quote. AutoCAD drawings and AutoCAD details for overhead steel doors may be selected on the CAD FILES option to the right. The AutoCAD drawings and AutoCAD details comply with 08360, 08400 & 08330 construction specs for insulated doors. You’ll find useful information regarding the operation, including both manual and motor operation. Alpine’s IMB-V8® overhead steel doors are insulated doors that comply with the 08330 construction spec. Energy costs are continually on the rise. To help combat the problem as well as provide better protection against the elements, Alpine offers our IMB insulated roll up shutters. The IMB-V8® overhead security doors are a rolling door designed specifically to provide energy efficiency while utilizing a heat resistant polystyrene insulation with a low thermal transmittance factor. For integral frame shutters or fire doors, please select the item from the product index. The IMB-V8® AutoCAD drawings and AutoCAD details for insulated roll up shutters are for informational purposes. They may change at any time. The CAD detail and CAD drawing reflect the options that are available to the architects and engineers compiling a drawing of overhead security doors to present to contractors. The AutoCAD detail and AutoCAD drawing will be updated regularly. Alpine’s overhead steel doors are built to last. Call Alpine today to find out which security shutter is right for your specifications! To download coiling door specifications, please click below. NOTE: For specifications for overhead coiling doors and soundproof shutters, architects must choose from a variety of options. The standard choice will be shown first in plain text followed by the options shown in [brackets] (Example “Finish: Galvanized [Powder coated] [Baked enamel]”). 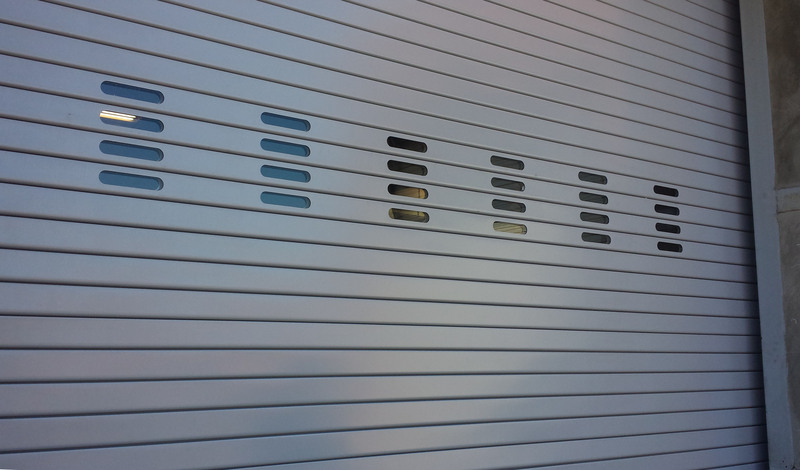 The specifier must make the appropriate choices for the soundproof rolling shutters and delete the others (Example: “Finish: Powder coated”). A. This section includes: [Manual] or [Electric] operated 15/16” thick Insulated Metal Backed Rolling Door. B. Product Data: Provide manufacturer’s standard details and catalog data. Provide installation instructions for Overhead Coiling Doors, Soundproof Rolling Shutters. ii) R-Value: 8.0 (U-factor of 0.121) calculated using the ASHRAE Handbook of Fundamentals. i) Front slat: Minimum 22 gauge [20, 18, 16 gauge] steel or .050” thick aluminum. ii) Back cover: Minimum 24 gauge [22, 20] steel or .040” thick aluminum. 1. Bottom Bar: Vinyl astragal. Energy costs are continually on the rise. To help combat the problem as well as provide better protection against the elements, Alpine offers our IMB insulated rolling door design. The IMB-V8® insulated overhead steel doors are a rolling door designed specifically to provide energy efficiency while utilizing a heat resistant polystyrene insulation with a low thermal transmittance factor. Alpine’s coiling shutters and overhead security doors make for perfect heat doors and oven doors along with many other applications. The metal on the metal insulated slat of these soundproof rolling shutters have polystyrene insulation that is a minimum of 15/16 ” thick. Slats are available in 22, 20, 18, and 16 gauge steel with a backing of 24, 22, or 20 gauge steel and also available in B.S. Aluminum. Polystyrene slat insulation offers maximum thermal protection for these sound resistant doors and soundproof shutters. Insulated rolling doors can be push-up, hand-crank, hand-chain or motor operated. All operators can be adapted to specific conditions for your soundproof shutters.